Find and book the perfect boat. Your boat adventure starts here! and explore our manually selected fleet from world-class charter companies and trustworthy private owners. your personal boat trip project! Manage all your offers in one window, explore itineraries and invite your friends! with boat owners and boat experts worldwide. Our trip advisors are available 24/7. and feel safe. All the payments are insured by RentalYachts.com Financial Security System. My experience with RentalYachts was excellent. Me and my friends had the best time ever, sailing from Zadar to some of the offshore islands over a week. No problems, though I knew nothing about how to book a boat at the beginning. Staff not only helped me find a boat exactly for my dates and geography, but also offered a really good deal. What more can I say? Vacation was just lovely! Thanks to RentalYachts.com for my first rental boat experience! 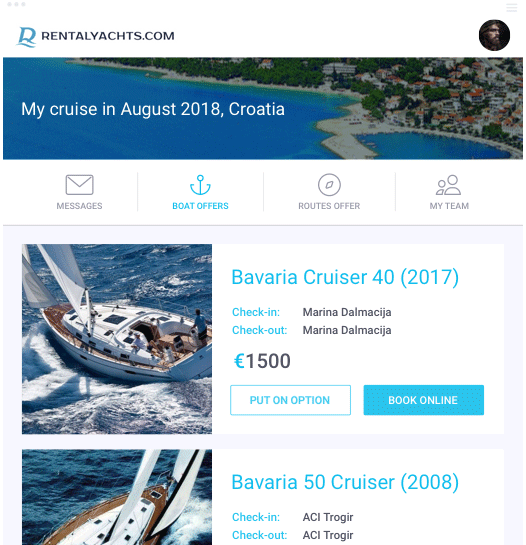 You are just like booking.com but for boats. Or even better! Top quality service, quick answers and good communication.